Welcome to the latest newsletter for CeRDI. There has again been much activity in the Centre over the last few months. 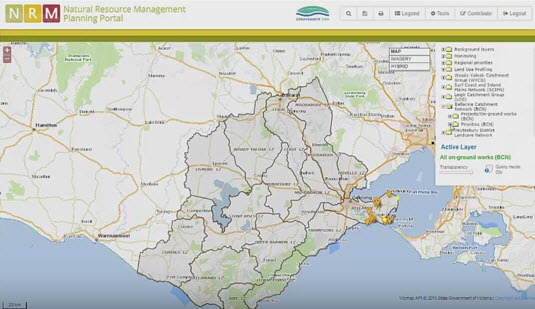 Highlights were the launch and completion of some important projects including the South West Climate Change Portal, and the Great South Coast Digital Strategy, both of which have been very positively received. It has been terrific to see members of the CeRDI team – staff and post graduate students – travelling far and wide for research trips and conferences. Birgita Hansen recently returned from Hokkaido, Japan, following a field trip to undertake migratory shore bird research. Closer to home, I travelled with a delegation of FedUni (including CeRDI) PhD students and staff to attend the Regional Universities Network (RUN) annual conference in Rockhampton in June. CeRDI PhD students Shirish Sharma (Smart Cities), Thomas Hill (Precision Agriculture), Himalaya Singh (Sports Injury Prevention) and David Ebbs (Sustainable Water) all presented at the conference. The opportunity for knowledge sharing and industry networking – and to enjoy some warmer weather – was appreciated by all who attended the conference. CeRDI’s research has received the attention of the spatial industry, having recently been featured in an article in Position, the only independent publication for surveying, mapping and geo-information in Australian and New Zealand. This latest article describes the Centre’s application of spatial mapping in solving complex projects. The Centre’s 2015 Annual Report has recently been released. This publication shares and celebrates the activities undertaken in the Centre during 2015. We hope you find interest in the stories showcased in this newsletter. If you have any feedback about the newsletter or research profiled, please contact us. Online Farm Trials research led by CeRDI and supported by the Grains Research and Development Corporation has recently received additional funding which brings total research investment to around $2m over four years. OFT is helping to improve the productivity and sustainability of farming enterprises by improving access to trial research information. This is achieved through two online research applications, the Trial Explorer and the Report Library. OFT unlocks farm trials research that has previously been accessible only via hard copy or basic electronic documents, opening up information from Australian cropping trials across all three GRDC regions. Commencing in 2013 with CeRDI’s Rob Milne as project manager, OFT relies heavily on input from industry stakeholders, including grower groups, research organisations, agricultural experts and grain industry organisations. updating and improving the OFT website and online trial searching and information discovery tools. GRDC has also extended the Online Final Reports research to a four year program. Online Final Reports research has led to CeRDI developing a digital repository of all grains final reports dating back to the early 1990s. This project has enabled GRDC to evaluate, convert and collate reports into a consistent and accessible format for easy access and comparison. Innovative knowledge management approaches are supporting greater research access and uptake across the grains industry. 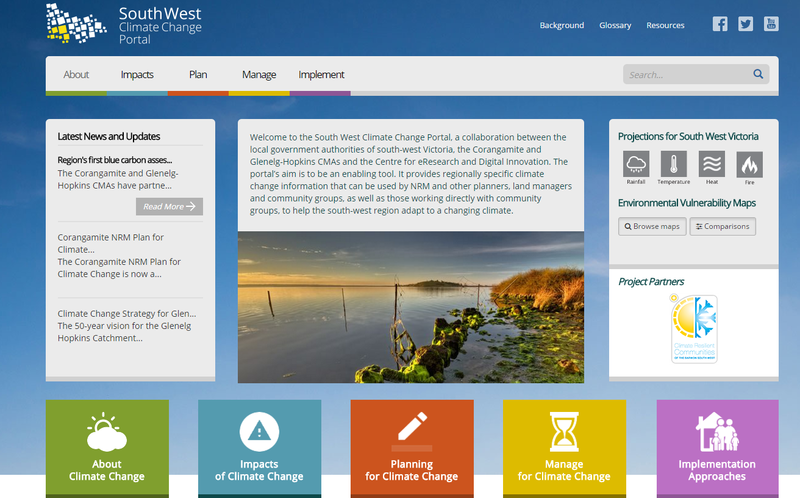 The South West Climate Change Portal has been launched offering a host of information and resources – including planning tools, maps and visualisations – to enable planning for the impacts of climate change. The portal has been designed specifically for natural resource managers, local planners, land managers and other regional organisations who are working closely with local communities to respond to the current and future threats posed by climate change. The project is the culmination of an extensive body of work by the project partners including the local government authorities in the south west region of Victoria, the Corangamite and Glenelg-Hopkins Catchment Management Authorities (CMAs) and CeRDI. Comprehensive information and data is available to examine the predicted impacts of climate change. The portal also provides links to government policies pertaining to climate change and provides tools to support regional climate change planning and management. Resources and funding information to support both adaption and mitigation approaches to climate change are also available. ‘The spatial maps and visualisations provide a valuable resource to assist with local decision making. They enable comparison of climate change scenarios. The regional maps also identify vulnerability and impact layers that can be used by communities and regional planners in planning for mitigating threats associated with climate change’. Regional stakeholders will continue to update and expand the portal content in the future. There may be opportunities to expand the portal research and engagement model to other geographical regions where the impacts of climate change on the environment, local communities and the economy are expected to be high. Future CeRDI research will examine how access to the South West Climate Change Portal guides decision making and changes stakeholder and community practice. CeRDI has released its 2015 Annual Report. The report profiles the diverse research undertaken in the Centre and highlights the continued importance being placed on establishing and fostering strong partnerships, through engagement with industry and government. The Centre's achievements in research and innovation have led to growing research capabilities across core areas including agriculture, natural resource management, heritage and culture, hazards planning and resilience, health and wellbeing and regional development. CeRDI’s success is further reflected through growth in research funding, research publications, prestigious awards and via an expanding post graduate student cohort. Throughout 2015, CeRDI continued to build its reputation as a leader in digital transformation and practice change and has established itself as having strong eResearch capabilities that include a comprehensive model for data discovery, technological and longitudinal impact research. Supported by a growing team of researchers and technical staff, the Centre continues to develop its expertise and capabilities as reflected in the research stories presented in the 2015 Annual Report, and complemented by the Centre’s previous, 2014 Annual Report. CeRDI recently completed the Great South Coast Digital Strategy, which culminated in the presentation of the research findings and final report. CeRDI together with Lateral Plains were contracted by the Regional Development Australia - Barwon South West Committee to develop the strategy for the Great South Coast Region. The region comprises the local government areas of Colac Otway Shire, Corangamite Shire, Glenelg Shire, Moyne Shire, Southern Grampians Shire and Warrnambool City Council. CeRDI’s Director, Helen Thompson, and Jennifer Corbett worked closely with George Fong, Director Lateral Plains to prepare the Strategy with the aim of determining the uptake, adaption and engagement of digital technologies and solutions by businesses in the region. Surveys and interviews with key stakeholders were conducted to ascertain levels of digital uptake and to talk with businesses that had already established strong digital initiatives. The Great South Coast Digital Strategy provides an overview of the economic and digital technology context for each region, supported by insights from key business stakeholders. The report highlights many business and technology innovations that are evident across the region and showcases the successful uptake of new technology within traditional industry sectors, such as agriculture and tourism. The Strategy also reports on the key issues and challenges for the region and includes recommendations for building stronger linkages between regional goals and local, state and federal government policies. This Strategy extends previous research undertaken by CeRDI and Lateral Plains in 2011 for the Great South Coast Communication Strategy, which was undertaken to support the National Broadband Network roll-out for the region. The Latham’s Snipe project team visited Hokkaido between July 9 and 22, to work with the Wild Bird Society of Japan (WBSJ) on their snipe research. During the visit, the team assisted with snipe capture and exchanged knowledge about snipe ecology and conservation. CeRDI’s Dr Birgita Hansen presented at a WBSJ-organised community workshop on snipe, along with several other notable snipe experts from Japan. 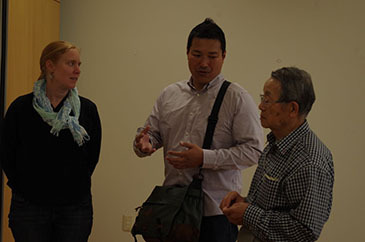 She and the project team participated in a workshop discussion on how to address declines in the species in Japan. During both the workshop and snipe capture field work, Hokkaido Television Broadcasting and Hokkaido Newspaper were present. Birgita spoke with them about the project in Australia and the team’s experiences working with their Japanese colleagues. Latham’s Snipe team at Benten Lake study site. Dave Wilson and Jodie Honan. The project team also visited two schools, Uenae Elementary and Junior High School and Sapporo Kaisei Secondary School. There, Birgita spoke about the snipe research project and issues with wetland protection across the species’ range. At Uenae, Jodie and Richard led a series of fun games with the students to share key messages about snipe. Postcards made by primary school students at Port Fairy Consolidated School were given to the students, and they were encouraged to write back to the Port Fairy students. At Sapporo Kaisei Secondary School, more serious conversation was had about conservation of snipe and their habitats, and group discussions with students enabled the team to speak about avian science and share their knowledge about bird studies. The trip was a great success and the team learnt a lot from their Japanese colleagues, as well as sharing many of the experiences and knowledge they have gained through their work in south-west Victoria. The Latham’s Snipe Project has forged a strong collaboration with the Wild Bird Society of Japan and looks forward to future research visits and knowledge sharing. The project team would like to thank the Australia Japan Foundation for providing financial support to visit Japan. They would also like to thank Tatsuya Ura, Seiji Hayama, Hironobu Tajiri, Keisuke Ueda, Takemae Asako, Kondo Syunsuke, and Abe Kazuyo at the WBSJ, Satoshi Nakamura and the friendly staff at Lake Utonai Nature Center, Dr Reiko Kurosawa at Japan Bird Research Association, and Oi-Yee-Claudette Chan and Iino Shuichi at Sapporo Kaisei Secondary School. More information can be found at https://lathamssnipeproject.wordpress.com/news/. Western Alliance is an academic health science centre and network established in 2014 as a partnership between academic research institutions and the major health service providers across western Victoria. Federation University Australia joined as a Governing Partner in 2015. 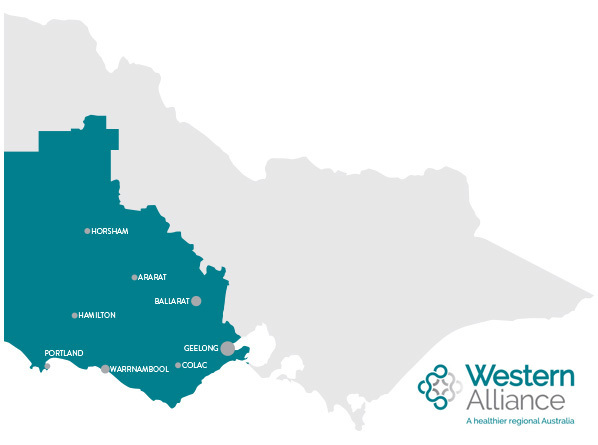 Western Alliance’s vision is a healthier regional Australia and its mission is to improve the health and wellbeing of western Victorians through collaborative health and medical research, education and training. On behalf of Federation University Australia, CeRDI hosted a data scoping workshop for Western Alliance on 18 July. The workshop was facilitated by Dr Renée Otmar, Western Alliance and Dr Joel Epstein, CeRDI. Participants included broad representation from key stakeholders in the region. In his introduction to the workshop, Professor David Ashley, Executive Director of Western Alliance, outlined that a key priority of Western Alliance is the strategic use of data to better understand the state of play of health in western Victoria. This is of particular interest, given the significant differences in health outcomes between regional and rural Victorians, and their metropolitan counterparts. Currently health data in the region are relatively un-tapped and not well connected; there is the opportunity to gain insights into the key drivers of the disparity in health outcomes and propose appropriate interventions based on analysis of these data. The value of doing so extends beyond western Victoria, as the region can provide a snapshot of the rest of Australia, given its demographic indicators closely resemble those of the nation. At the workshop, Professor David Ashley and CeRDI Director Associate Professor Helen Thompson presented ideas for appropriate data infrastructure models to establish a regional data collaboration. Workshop participants discussed the types of data required and the types of studies that may be facilitated through a regional data collaboration, as well as the range of data already available across the region, and the opportunities, challenges and risks associated with such an initiative. The workshop participants indicated strong support for a regional data collaboration established under the aegis of Western Alliance. David Ebbs, Adam Hulme and Corrine Duncan. The Regional Universities Network (RUN) third annual conference was held in Rockhampton, Queensland, from the 21 to 24 June 2016. Attended by over 150 delegates from the six RUN universities, government and business representatives, this was an opportunity for a number of FedUni staff, researchers and HDR students to present their work. This included Professor Caroline Finch (ACRISP), Associate Professor Helen Thompson (CeRDI) and Bonnie Chew (Aboriginal Education Centre) along with HDR students Shirish Sharma (Smart Cities), Thomas Hill (Precision Agriculture), Himalaya Singh and Adam Hulme (Sports Injuries) and David Ebbs (Sustainable Water). An article profiling CeRDI’s spatial research has been published in the latest issue of Position magazine. Position is the only independent publication for surveying, mapping and geo-information in Australian and New Zealand. The article describes the Centre’s application of spatial mapping in solving complex projects for industry. It highlights some of the Centre’s flagship projects in which the latest innovations in spatial technology have contributed to industry change, raised public interest, led to ongoing industry funding and awards success. 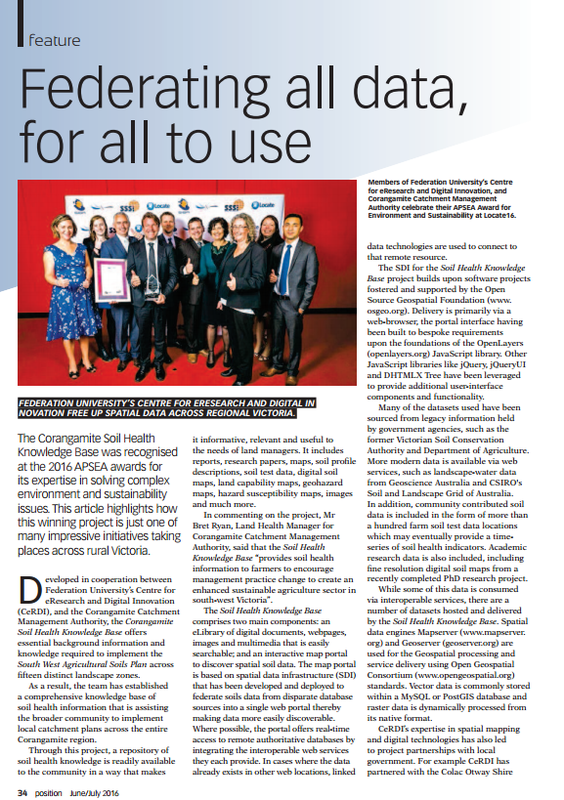 This has been recently highlighted by the awarding of an Asia Pacific Spatial Excellence Award (APSEA) for Environment and Sustainability for the Corangamite Soil Health Knowledge Base project. 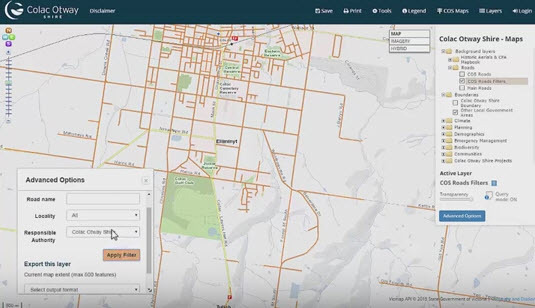 Other CeRDI-led research featured in the article included the Colac Otway Shire Mapping Portal, Barwon South West Interoperable Spatial Knowledge Base, Historic Urban Landscape and Visualising Ballarat. As well as highlighting CeRDI spatial innovations, the article refers to the importance placed on establishing strong and enduring research partnerships. This is an important hallmark of the Centre’s relationship with industry partners and stakeholders and CeRDI’s success. 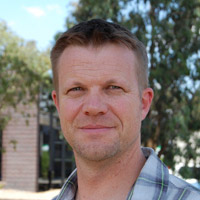 Rob Milne first joined FedUni in 1997 to work with the Centre for Environmental Management (CEM), based in the School of Science (now the Faculty of Science and Technology) following a few years working on the family farm near Cavendish, Victoria. Rob worked on a wide range of environmental and conservation-based consultancy and research projects with the CEM team including conservation planning, ecosystem condition assessments, environmental impact and risk assessments, flora and fauna surveys, and mapping. GIS and spatial technology became a central part of Rob’s activity with the CEM. These projects were conducted with a range of stakeholders such as State and Federal Government departments, Parks Victoria, VicRoads, catchment management authorities, local government, private industry, Landcare groups and the community. Rob joined CeRDI in 2013 seeking to explore new opportunities in the application of technology – particularly online platforms and spatial systems – for facilitating scientific research, knowledge sharing and discovery. Working with the technical team at CeRDI, Rob has gained new skills in web-based geospatial technology and data management systems and is an open source software and open data enthusiast. Taking inspiration from the Visualising Victoria’s Groundwater project led by Peter Dahlhaus and Andrew MacLeod, Rob has been working with the CeRDI team and a range of stakeholders to develop a web-based spatial portal to assist the community in accessing, visualising and sharing environmental data and information across Victoria. The Visualising Victoria’s Biodiversity project is strongly linked with the SWIFFT (Statewide Integrated Flora and Fauna Teams) citizen science and knowledge sharing initiative. Since joining CeRDI, Rob has also focussed on helping to develop a national agricultural research repository and data sharing platform. Supported by the Grains Research and Development Corporation, the Online Farm Trials website provides a self-service system for researchers and regional farming system groups to upload, manage and share their cropping research project information and data. Chris commenced her PhD at CeRDI in March 2016. She is investigating the application of international interoperability standards to farm animal welfare and productivity data. Such data is collected from existing and new sensor hardware and currently stored in disparate data collections. The research will focus on ways to federate and visualise this data with related geo-spatial information. It is particularly concerned with rangeland livestock production systems. Chris has strong ties to agriculture having completed an Agriculture Science Diploma. She has worked on farms for a number of years and now runs a small commercial horse stud. Her interest and competency in IT related fields is also well established, underpinned by a Bachelor Degree with Honours. Her particular areas of interest are databases, data visualisation and web technologies. The precision agriculture PhD project now allows Chris to combine her interests in IT and agriculture. This research has the potential to contribute significantly in an industry that is experiencing rapid change and uptake of new technologies. Chris recently participated in field work which involved collecting animal welfare and sensor data. This opportunity followed discussions with Simon Falkiner and Peter Dahlhaus around research collaboration linked to animal welfare. Chris joined Simon at Murdeduke Station to fit monitoring headstalls on 80 heifer cattle. The data that is collected on the animals' behaviour from these collars will be combined with video and other data and will be available for Chris to analyse as part of her PhD. 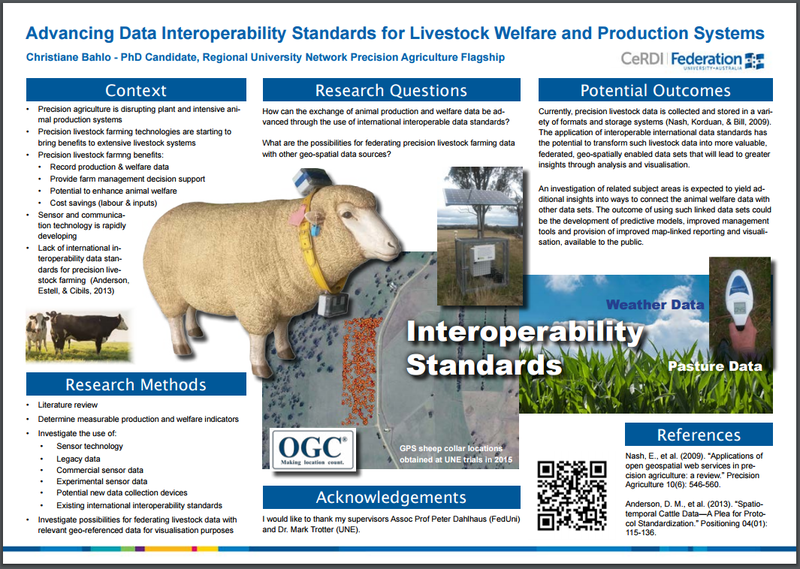 Chris prepared a poster for the FedUni conference, a copy of which is presented below. Historic Urban Landscapes (HUL) and Visualising Ballarat has been established by CeRDI in collaboration with the City of Ballarat to provide insight into Ballarat’s past, present and sustainable futures. The portals have been designed to assist stakeholders, community members, practitioners and researchers to collaborate and identify community values, landscape values, with information about acceptable levels of change and to provide certainty as to priority development to attract and support. 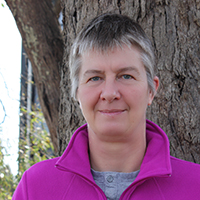 New CeRDI postgraduate students: Alison Ollerenshaw commenced her PhD at CeRDI at the start of July. Alison will be conducting research alongside the Western Business Accelerator and Centre for Excellence (Western BACE) at Melton. Alison’s supervisors: Dr Angela Murphy (Principal Supervisor; FedUni), Professor Suzanne McLaren (Associate Supervisor; FedUni) and Associate Professor Helen Thompson (Associate Supervisor, FedUni). FedUni Research Conference. There was a strong presence of CeRDI post-grads at the conference that was held at the Mt Helen Campus during July. CeRDI PhD students David Ebbs, Thomas Hill, Shirish Sharma and Himalaya Singh each delivered oral presentations during the conference. Chris Bahlo presented a poster at the conference. Congratulations to Thomas Hill who received third prize at the conference for his oral presentation and Chris Bahlo, who was given an honourable mention for her poster presentation.